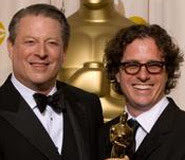 ARRA News Service: "An Inconvenient Truth" Displays Al Gore's Inconvent Truth! As an atmospheric scientist, I can clarify that in the 70's as the article indicates, there was speculation on climate patterns that would lead to an ice age. That research ultimately lead to the opposite conclusion. Global average temperatures are in fact rising steadily at a rate far more rapid than any natural rate observed in the Earth's history. Understand that "Global Warming" is not as simple as watching the temperature rise. Rising temperatures in one place can lead to prevailing winds that help cool another. Changing sea-surface temperatures can dramatically affect local climate in bizarre, counter-intuitive ways. An example: Glaciers on Mount Shasta in California have been increasing. Taking only this information, one could conclude the scientists are wrong. But looking at more glaciers spread across the globe, we see them receding at an alarming pace. Al Gore is right in stating that Climate Change is a moral issue. Humans have affected the climate in a measurable way, and practical solutions should be pursued by all political parties. The above posted comment said "As an atmospheric scientist, I can clarify . . ." This is the first atmospheric scientist named "anonymous." Interesting! Stating that Climate Change is a "moral issue" is conjecture not fact. If as the person says, "Humans have affected the climate in a measurable way," then are they advocating that those parts of the world with alleged overpopulation should have a population reduction. Ever notice the former claims of damage from methane gases. Studies also showed that the cattle population (worshiped in India) contributed significantly (more than the humans) to increase in global methane gas. Interesting that a few belching volcanoes contributed more than all the other sources. Would anonymous advocate the eradication of India sacred cows? Note that Hindus do not eat their cows and it is reasoned that starvation in areas of India would decrease if these sacred cows were not alive to eat grain which would then be used to feed the people. But then oops there would be more people and the "dang nabbed" people are the cause of the global warming problem. The global warming problem can't be cyclic. Ever wonder when and how the Vikings farmed Greenland before it was covered in ice? Maybe it was a whole lot warmer in those days. If the weather is not cyclic, and humans cause the problem, then back when Greenland was really green, there must have been all that hot air caused by the Vikings exploring the North seas. The inconvenient truth for many is that Al Gore is a global con artist. He didn't invent the Internet and he position on global warming is unsubstantiated. Global warming and global cooling do exist but will continue even when the demigods of climate change are deep in their graves. Unfortunately, by then our civilization will have been affected by their chicanery.